Cars got quicker, more powerful by weight, and more fuel efficient in the last 40 years. Over the past 40 years, light-duty vehicles in the United States have achieved remarkable gains in both fuel economy and performance. 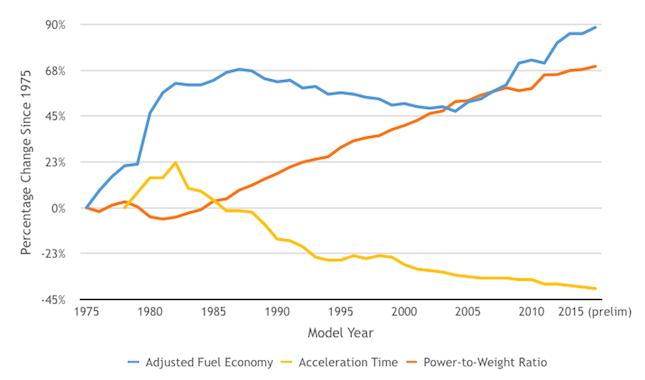 The graph below shows average miles per gallon, power-to-weight ratio, and 0-to-60 acceleration time of new cars and light trucks since the late 1970s. Fuel economy improved dramatically from 1975 to 1987, driven by the original Corporate Average Fuel Economy (CAFE) standards, which were adopted in 1975 in response to the 1973 oil embargo by Arab states. Average fuel economy drifted downward for the succeeding 17 years, as CAFE standards remained almost unchanged and the SUV claimed a growing share of the vehicle market. But with legislative and regulatory actions during the Bush and Obama administrations, fuel economy has been on the rise again since 2004, increasing nearly 90% over 1975 levels. Meanwhile, power-to-weight ratio and 0-to-60 acceleration times have improved by 63% and 40%, respectively, since 1978. Despite big changes in vehicle size and shape, gasoline price, and fuel economy standards, performance has marched pretty steadily upwards since the early 80s, thanks to incremental improvements in engines, transmissions, materials, and design. The pace of technological advance has picked up with higher CAFE standards, but it remains to be seen whether further reductions in acceleration time, now approaching 8 seconds on average, will still be viewed as a market imperative as greenhouse gas reduction efforts gain momentum. With a shift to size-based standards mandated in the Energy Independence and Security Act of 2007 (EISA), the CAFE program is now designed to ensure major fuel economy improvement for each vehicle class, while leaving the size distribution of vehicles sold to market forces. This structural change in the standards facilitated the long-sought tightening of standards delivered by EISA, but any sustained shifts in the market toward larger vehicles, and from cars to trucks, could mean that the average fuel economy resulting from the more stringent standards over the next decade will fall short of the expected value. Data source for figure and text: Light-Duty Automotive Technology, Carbon Dioxide Emissions, and Fuel Economy Trends: 1975 Through 2015. EPA-420-R-15-016. December 2015. http://www3.epa.gov/fueleconomy/fetrends/1975-2015/420r15016.pdf. For more on national energy metrics, see Energy Efficiency in the United States: 35 Years and Counting.